Last week, I talked on Facebook how mismatched afghans mean a lot to me as it’s a reflection of my mother’s creativity when I was really young. I spoke about our quilts being made from old clothes without a real sense of design or colour scheming. They were always really warm and most dear to my heart when I think back to my childhood. 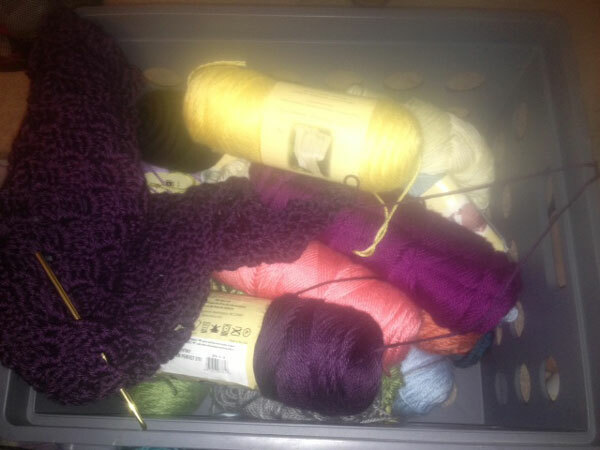 Victoria’s Mis-Matched Yarn Box. A reminder of what creativity means to people around us. Victoria wrote me a letter. With her permission, I can share it with you. The other day, maybe 2 weeks ago, you shared your story about mismatched blankets and how they touched you. I was upset, money and medical bills seem to do that, and I was talking to my mom. I spoke about how if the pace I’m going I won’t be able to afford anything. My mom reminded me how sometimes if you give what you have that’s already enough. “Of course I do”, I replied. “For Christmas you can make blankets or stuff out of that. Everyone would love it!” my wise mother suggested. “Of course I would. You make the best blankets, they are so warm.” she assured me. After I hung up the phone I just cried. I came to the realization that it’s really time people care about and my afghans are part of my time, creativity and energy I am putting forth. So I started today, thanks for the re-affirmation of my mom and the inspiration from The Crochet Crowd, my new mismatch blanket making is now under way for Christmas 2013! This entry was posted in Advice & Tips, Fascinating People and tagged Blanket, Children, Christmas, Creativity, Crochet, Facebook, Mikey, Shopping, The Crochet Crowd. Bookmark the permalink. when I was a teenager about 40 years ago, I made a blanket for my dad out of my mother’s stash yarn. It was pretty simple–a row of sc, a row of dc, then a row of dc in white. I thought it was pretty ugly, but my dad loved it and took a nap every day with that blanket. It was the first thing he asked for when he came home from the last trip to the hospital, and it was on his bed when he died. Since it had no meaning to anyone other than him, we chose to bury it with him. It brings me comfort knowing it’s still with him! Ok now I am really crying Inkpattie.. Lovely story. Bless you. Sometimes we think that what we make and give to family and friends are not that important. But believe me they are. I have 2 quilts that my great grandmother made, a granny square afghan that my Nana make and numerous things my mother made over the years. They are all very precious to me! I think your idea is wonderful, Victoria! I make stuff for other people all the time, and I love doing it. If someone took the time to make something for me… I’d think I had a pot of gold!!!! I use up all kinds of yarn to make Scrap-ghans and then I donate to local charities. I pray for those who will end up with them with each stitch I make that they will be a blessing to them. Just donated one to our local Kiwanis yesterday for a family that was burned out of their home. We had a quilt that my great grandmother and great aunts put together from bits of old clothing. I believe they’re called Crazy Quilts. Granny squares are great for using up the leftovers, but if it were me (my leftovers are skimpy as I’ve recently rediscovered crocheting), I would free form pieces to put together. It’s the challenge of putting the bits together and filling in the blanks that I would love! I make lapghans throughout the year from my mismatched stash, and in Dec. I deliver them to the county nursing home. I, also make baby hats to donate to local hospital. Love using up my stash to donate. I would like to see more of these mismatched afghans because there is such creativity in putting the “mismatched” stashes together…. I call them “ugly afghans” because there is no rhyme or reason to the colors. I start crocheting and use up whatever stash I can. The bits and pieces left over from other projects remind of the people and reasons I made those projects for over the years. Okay, make me cry in the morning Mikey. Your Mom is a sweetie ❤ her. Mikey and Victoria – both of your stories inspired me to use my stash (I have enough to probably open a stash store!) for mismatched afghans. I am also in “financial stress” and crocheting relaxes me. It brings me peace. Sometimes I do wonder if family members / friends even care about the time and love put into each stitch. In the end though it doesn’t matter because I care. I seldom makes things for me. I enjoy giving to others and you reaffirmed that stash works! Thank you both!